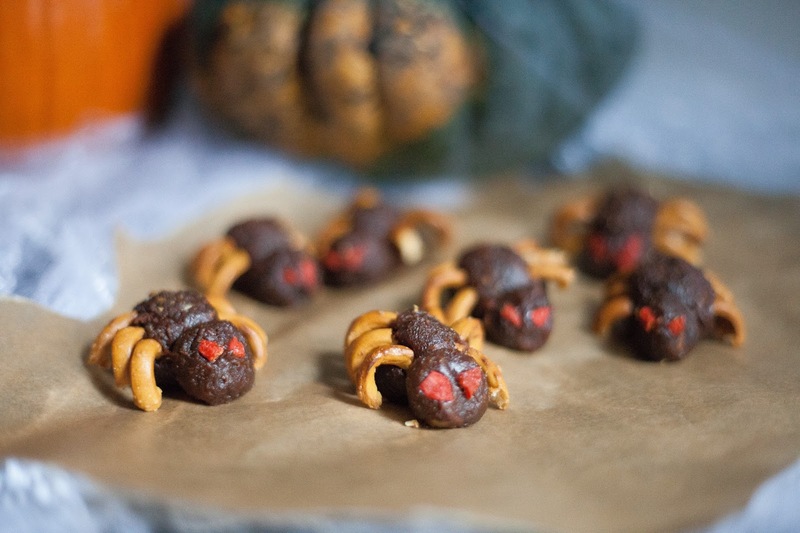 Date and cacao chocolate spiders with pretzel legs and goji eyes! -In a high power blender whizz up the dates and cacao on high speed until a smooth paste is formed. -Roll the paste into 12 small 1cm diameter balls and 12 2cm diameter balls, placing on a paper lined plate. Put in the fridge for 30 mins to set slightly. -Once the balls have had a chance to set, remove from the fridge and begin to arrange your spiders. You need to use a the smaller ball as the spiders head and the larger as the body so stick them together as so. -Break the preztels carfully in order to create legs for the spiders. Stick the pretzel legs into the side of the spiders body and finish by cutting goji berries in half and arranging to create red eyes.